Aluminum City is the best choice for patio covers in San Diego, Escondido, Chula Vista, and surrounding areas since 1963. We are a locally owned, full-service patio cover company that specializes in selling and installing aluminum patio covers, window awnings, door hoods, room enclosures, and carports for residential and commercial applications. Having more than 30 years of hands-on experience each, our owners will personally ensure that you get exactly the shade structure you need at a price you can afford. 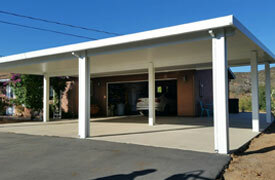 We offer some of the lowest prices you'll find for patio covers in San Diego, and yet never compromise on quality. All of our patio covers feature the industry's highest quality materials, exceptional workmanship, and the best warranties in the industry. As a result of the unbeatable value we consistently provide, Aluminum City has thousands of satisfied clients, an A+ rating with the Better Business Bureau, and an exceptionally high rate of referrals and returning clients. 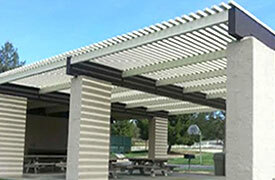 Whether you want to expand your outdoor living area in Poway or reduce the amount of sun that comes into your home or business in Rancho Bernardo, our aluminum patio covers and related shade structures are the perfect solution. Aluminum shade products are not only affordable, but also versatile, beautiful, low maintenance, super lightweight, and effective at dissipating heat. They can also be extremely sturdy and long lasting, easily maintaining their condition for over 40 years. Each cover can be installed within weeks of the contract date and customized to meet each client's needs and preferences. 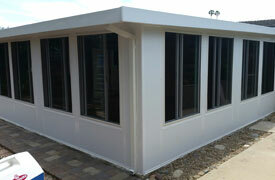 Aluminum City is a Four Seasons Building Products authorized dealer. Four Seasons Building Products is one of the nation's largest manufacturers of aluminum outdoor living products, and excels in making patio covers, carports, and patio room enclosures of unparalleled quality. In fact, they are the only manufacturer to bake on enamel primer before applying enamel paint on all of their aluminum products. Additionally, their aluminum products are thicker than those made by competitors, which contributes to better construction and durability. Moreover, because Aluminum City's owners perform all installations themselves and don't use any salesmen, we're able to offer Four Seasons Building Products' superior patio covers at prices that are significantly lower than other San Diego patio cover installers. Call licensed and insured Aluminum City today at (619) 562-1652 to learn more. We are open Monday through Sunday, from 7:00AM to 10:00PM. We are happy to answer all of your questions over the phone or on site. Our consultations are free and a great way to get a professional recommendation based upon your unique needs and preferences. 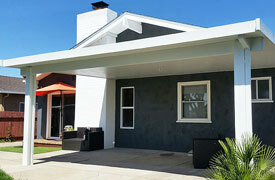 During a consultation, we'll take measurements, review photos and options, and help design a patio cover, patio room, window awning, door hood, or carport that complements your San Diego home or business and fits your budget. Awesome Patio Cover! You guys rock! I will definitely recommend you guys! The best price out there! Thanks Ed, Robert and Red! Great local company. Always takes care of all their customers. Highly recommend for all of your awning needs.